South Portland, Oregon Hotel's Guests Near Lake OswegoOur hotel's location, perks and friendly staff welcome you to an area defined by a rich history, lush scenery and a thriving urban center.At the Crowne Plaza Portland - Lake Oswego in Oregon, our hotel's guests appreciate being near high-tech companies in the Portland area's Silicon Forest. When you need to find a place to host an event south of Portland and near Beaverton and Tigard, our hotel's 5,000 sq ft of flexible meeting space, Business Center and Crowne Meetings Director make the decision easy because we are "The Place to Meet! "A vacation in the Willamette Valley is one filled with beauty. The nearby Columbia River Gorge offers scenic vistas, including popular Multnomah Falls, and downtown Lake Oswego features outdoor art and flowering baskets. With a terrific location south of Portland and close to Lake Oswego, our hotel's the perfect choice. We're near great shopping at Bridgeport Village, and you can spend a day touring local Willamette Valley wineries.No matter why you're here, we're sure you'll love our hotel. Indoor and outdoor pool, Fitness Center, Connections restaurant and the Crowne Plaza Sleep Advantage Program are just a few of the reasons why guests love us. Whether you're visiting Beaverton, Tigard, Wilsonville or Portland, Oregon, our hotel's the right choice. Oswego Atrium Restaurant and Bar: Enjoy Continental cuisine featuring fresh, local Northwest ingredients. Childrens's program - Portland Children's Museum, located near the Oregon Zoo, features fun and educational offerings for children of all ages. Bridgeport Village Shopping MallBridgeport Mall is a short 3 mile drive from the hotel offering high end shopping, a moving theater with an IMAX theater and a variety of restaurant options. Langdon FarmsLangdon Farms is located 10 exit south on I-5. It has a great practice facility and is a very well conditioned links golf course. Pumpkin RidgePumpking Ridge Golf Course is one of the most famous golf courses in Portland. This course has yearly LPGA Tour events as well as many other big named tournaments. Portland Classical Chinese GardensVisit one of Portlands more beautilful gardens. Located in Downtown Portland, just 15 minutes from the Crowne Plaza Hotel. Oregon Convention CenterPortland Oregon Convention Center. Located 7 miles North of the Hotel in Downtown Portland. 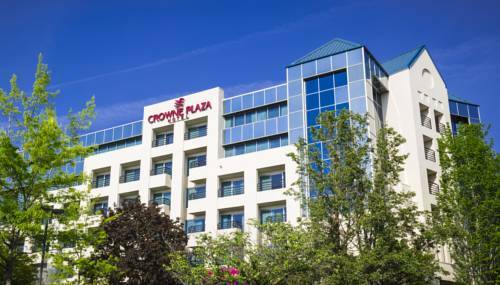 Crowne Plaza Lake Oswego has very easy access to the convention center. Woodburn Company StoresThe Crowne Plaza Hotel is located 20 minutes from Portlands number 1 Tax Free Shopping Outlet Mall. Wood Burn Company Stores are located just off I-5 in Woodburn Oregon. Oregon ZooThe Portland Oregon Zoo is located just minutes from the Crowne Plaza Lake Oswego. Langdon Farms Golf ClubLocated just South of the Crowne Plaza Hotels and is one of Oregon's best Public Golf Courses. Oregon Golf ClubLocated 10 minutes from the Crowne Plaza Lake Oswego. Oregon Museum of Science and Industry-OMSIOMSI is located in Downtown Portland and is a great place to take the family. Mt HoodMt Hood is Oregon's premier snow sport desitation.